In an attempt to build up its already bulging "we'll never really know why they did it" file relating to Islamist radicals taking innocent lives, three reporters at The New York Times composed a 1,900-word report Saturday evening (for Sunday's print edition) about Manchester bomber Salman Abedi's family background. 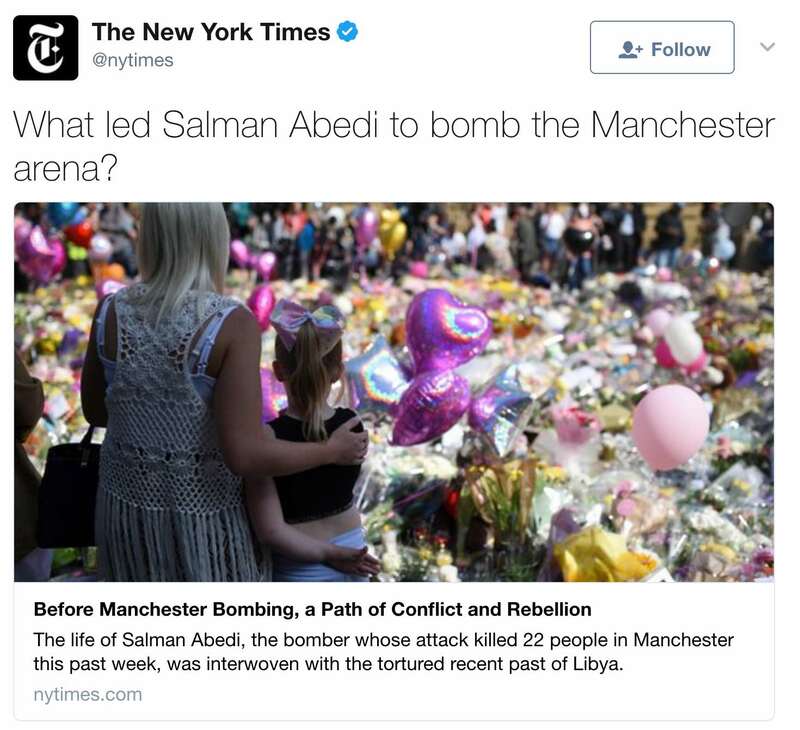 The reporters provided very little hard information about Abedi's motivations, despite the fact that readers who saw the paper's tweet (HT Twitchy) which promoted the article were led to expect it: "What led Salman Abedi to bomb the Manchester arena?" But they did push hard the news that Abedi called his mom before he carried the attack. The family background and ties back to the Hillary Clinton-driven chaos in Libya the reporters provided were useful (though, of course, Mrs. Clinton's name was never mentioned). But their recounting failed to genuinely reveal how someone could become so consumed with hate that they would be willing to kill themselves in order to kill as many others as possible at a pop music concert. "... the investigation continues into the network’s hierarchy, the precise logistics involved in planning the bombing, and what motivated Mr. Abedi." For the benefit of reporters Katrin Bennhold, Stephen Castle and Declan Walsh: Terrorist networks plan and carry out terrorist attacks. That's the motivation for their existence. ... The last time Salman was noticed at the mosque was during a Friday prayer session in 2015 when the imam gave a sermon that was critical of the Islamic State. Salman angrily objected. It was around this time that at least two members of the congregation reported him on a counterterrorism hotline for expressing extremist views. ... he is believed to have had links with other young residents of the city who joined the Islamic State in recent years, security officials said. One of them is Raphael Hostey, a prolific recruiter for ISIS who is believed to have been killed in a drone strike in Syria in May last year, aged 24. So the terrorist network was associated with and motivated by the Islamic State, the radical Islamist group which wishes to impose an Islamic caliphate on the entire planet, and has demonstrated its willingness time and again to kill anyone it can to further that goal, even if its members must kill themselves in to help achieve it. Abedi's angry 2015 outburst reinforces the fact that he was a strong Islamic State sympathizer. That alone would be enough to explain most or all of Abedi's motivation. But as an added bonus, based on what security officials have said, as seen above, Abedi himself may have been further motivated by the loss of someone he considered a hero, thus wishing to join him in reaping the eternal reward the Islamic State promised would await him for martyrdom. One supposes that the decision to lead with Abedi's phone call to his mom was designed to humanize him in some readers' minds, and to sow the seeds of confusion about his motivations that tie into the report's "conflict and rebellion" headline. But it's not at all unusual for murderers and terrorists to reach out to their mothers before or during their acts, or to leave a note behind for their mothers to see after their deaths. Now-deceased terrorist Tamerlan Tsarnaev reportedly called his mom "mid-shootout" the Friday after he and his brother committed the Boston Marathon bombing in 2013. Calling or communicating with mom doesn't make anyone just noted less of a murderer or terrorist, doesn't dilute the evil behind their motivations, and obviously does nothing to diminish the ugly impact of their acts. But it did help three New York Times reporters avoid the obvious.